Soak up the city sights in Canada’s welcoming cities and wilderness. Halifax and Canada’s Atlantic coastline is almost considered to be more Scottish than Scotland. Experience the epicentre of Canada’s music, film and fashion industries in Toronto, visit the Parliament building in the Canadian capital of Ottawa, follow the Saint Lawrence River to multi-cultural Montréal, or continue to Québec City, where bronze church spires rise above the city walls. 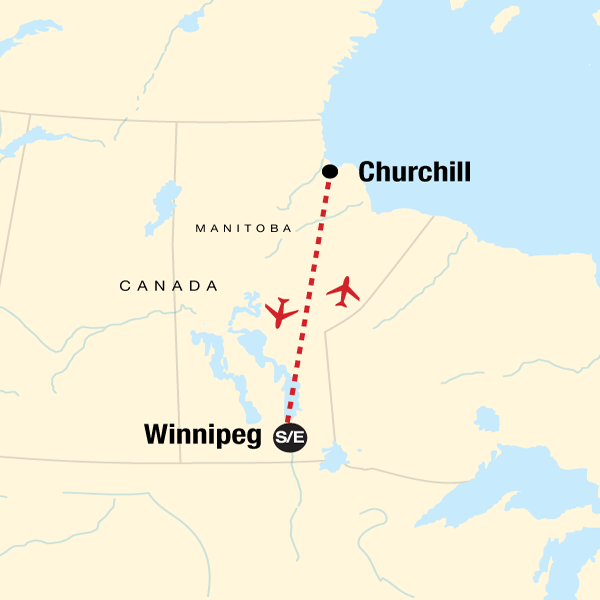 Central Canada is home to Winnipeg and Churchill, famed for year-round Polar Bear viewing. And, in Saskatoon the young and happening population are surrounded by ranches and prairies. Over on the west coast to experience Calgary’s cowboy culture, see the glass pyramids of Edmonton and enjoy Vancouver’s laid-back city life, glittering coastline and water-front forests. With flights to St John’s, Newfoundland, taking just over 5 ½ hours, Canada’s closer than you think. From here or Halifax you have an ideal base to explore Atlantic Canada. The rugged landscapes of Newfoundland and Labrador complement perfectly the rolling meadows and colourful cliffs of Prince Edward Island, Canada’s smallest province. Then there’s New Brunswick with its warm sandy beaches. Finally, you have Nova Scotia, which hosts many festivals and events throughout the year. Moving inland from the Atlantic Coast, step in Quebec with its mix of lively cities and stunning scenery. Montreal is a cosmopolitan mix and a haven for shoppers with a 19-mile underground city network, meaning there’s no need to go above ground. Especially useful during the cold winters! Quebec City, sat above the St Lawrence River is one of North America’s oldest cities and the old town has been classified as a UNESCO World Heritage Site. Ontario is a proper four-season destination with a mix of experiences available. Home to Canada’s capital city, Ottawa, which has a fascinating blend of history, culture and arts. Toronto, the largest city in Canada sits on Lake Ontario and offers a mix of architecture, food and shopping. Then you have Niagara Falls, a combination of natural beauty and the bright lights of entertainment. Away from the cities there are many parks to visit, such as Algonquin Park and further to the east the shorelines of the Great Lakes, Huron and Superior. Manitoba’s provincial capital is Winnipeg and as befits a capital is home to many great museums. It’s also the gateway to Churchill, Canada’s premier destination for Polar Bear viewing. It’s not just a winter destination though, as Polar bears can often be seen in summer when it’s also a perfect time to view Beluga whales. Saskatoon, like many Canadian cities is on the Trans-Canada highway and sits right in the middle of Saskatchewan’s prairies. Head out of Saskatoon and in the north of the province, where you’ll come across large untouched forests, which is a complete contrast to the land to the south. Alberta is home to the majestic Canada Rockies, with the towns of Banff and Jasper two of the highlights on any visit. At either end of the Rockies you’ll find Calgary and Edmonton. Calgary is probably most famous for its Stampede, held every July, when the city goes cowboy crazy! Edmonton straddles the North Saskatchewan River and mixes history with shopping in some style with the West Edmonton Mall, the largest in North America, housing both an indoor waterpark and amusement park. 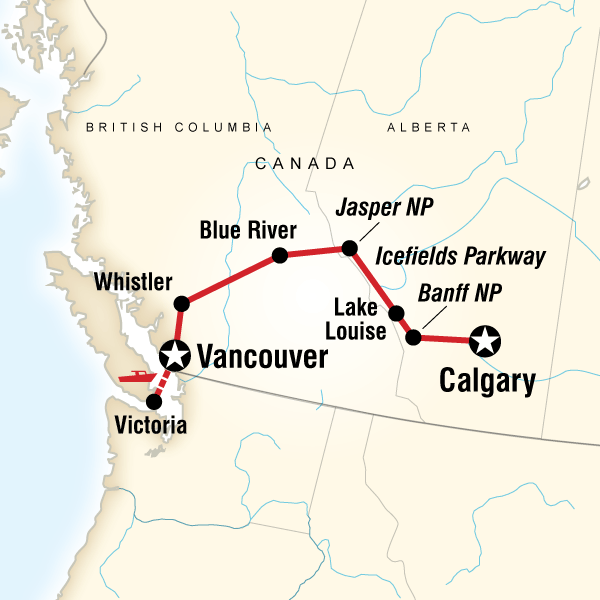 Vancouver combines the best of outdoor life with a vibrant and cosmopolitan city. With Stanley Park and beaches within walking distance of the downtown core it is easy to get away from it all. One of Canada’s leading mountain resorts, Whistler is less than two hour’s drive away, it’s ideal for skiing in winter and during the summer months you can mountain bike or hike the same mountain trails. The city of Victoria is located at the south end of Vancouver Island, it’s a great place for whale watching and as a starting place for those wishing to explore the island further. The interior of British Columbia is the perfect place for those whose passion is wine as many of Canada’s vineyard can be found around Kewlona and is an ideal area to break a journey between Vancouver and the Rockies. 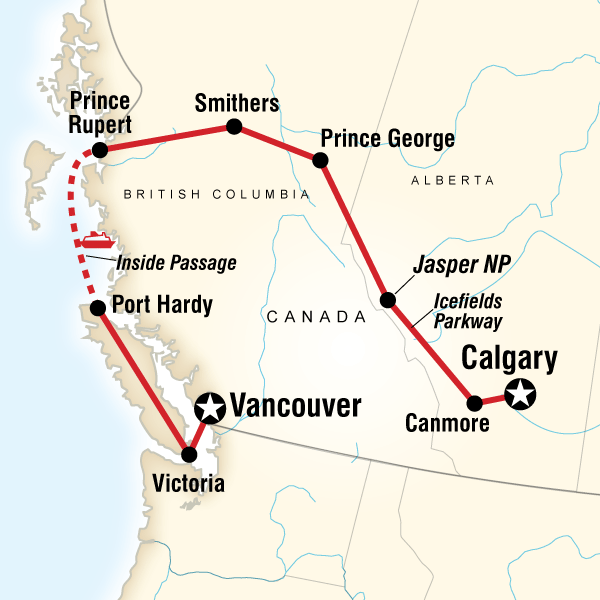 Canada is a vast country and flight times from the UK vary. 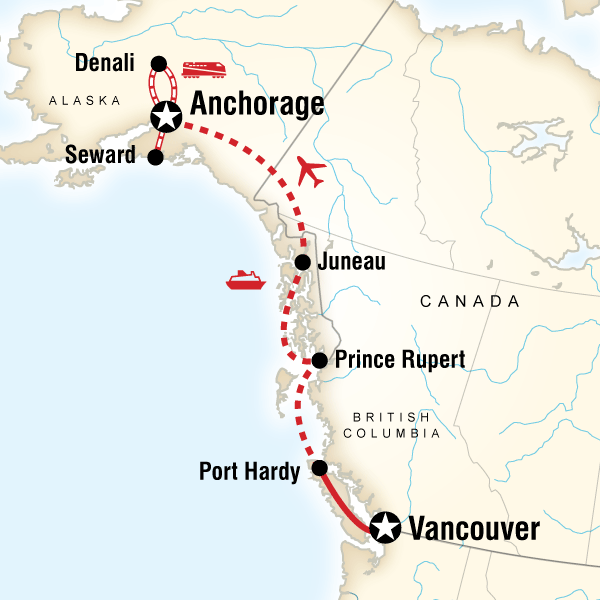 St. Johns in Newfoundland in Eastern Canada is just over 5½ hours from the UK, while Vancouver in the west is 9½ hours. Canada weather varies greatly from region to region and season to season. In summer, Vancouver has an average high of 25 (℃) with 8 beaches within the city to soak up the sun. Take a dip in Lake Ontario as average highs of 26 (℃) are ideal for sunbathing and swimming. In winter, Whistler Blackcomb near Vancouver gets almost 12m of snow each year at the summit, great for snowboarding! Ice skate along the frozen Rideau Canal in Ottawa and enjoy the Winter Carnival in Quebec City.